Until October 1, 2015 prospective immigrants can apply for adjustment of status only once their priority date becomes available or current based on their place in line on the Visa Bulletin queue. Waiting times have depended on the demand for immigrant visas and the visas available, per-country visa limitations, and number of visas allocated to each immigrant preference category. Why is there a Visa Bulletin? By law, the Immigration and Nationality Act (INA) limits the number of immigrant visas that may be issued to foreign nationals seeking to become U.S. permanent residents. Due to these limitations, the US Department of State allocates immigrant visa numbers for family-based and employment-based petitions. Family-sponsored preference visas are limited to a minimum of 226,000 visas per year and employment-based preference visas are limited to a minimum of 140,000 visas per year. These limits can be exceeded where visa numbers from the previous fiscal year were not fully allocated. Family-sponsored and employment-based categories are further divided into sub-categories, each of which is given a certain percentage of the overall visa numbers. Additionally, there are limits given to the percentage of visas that can be allocated based on an immigrant’s country of birth. 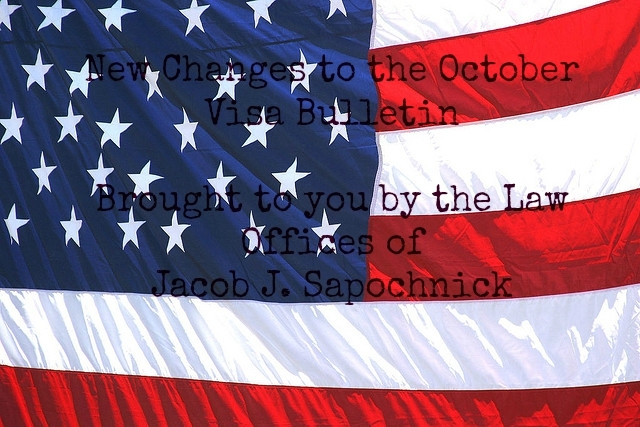 The October Visa Bulletin has introduced a new chart, titled ‘Dates for Filing Applications’ (in addition to the old chart known as the ‘Application Final Action Date’ chart listing single chart cut-off dates) that will allow family-sponsored and employment-based applicants to file their applications for permanent residence beginning October 1, 2015. In order to do so, your priority date must come before the new visa availability date that appears on the new ‘Dates for Filing Applications’ chart on the October Visa Bulletin. In other words, individuals with a priority date that is earlier than the ‘Filing Date’ cut-off on the new chart can file their adjustment of status applications beginning October first. Immigrant Visa Applicants (Consular Processing):Individuals with priority dates earlier than the date listed on the “Filing Date” chart for their preference category and country of chargeability will be notified by the National Visa Center that they may assemble and submit their documentation and begin the immigrant visa application process. However, a final decision on the immigrant visa application cannot take place until the priority date is current (i.e., is earlier than the “Final Action Date”). Prospective immigrant applicants will benefit from these new regulations because these changes will allow certain individuals to file their immigrant applications much earlier than they could previously under the old chart ‘Application Final Action Date.’ It is important to note that the benefit of filing an immigrant visa application under the new chart does not mean that prospective immigrants will receive their permanent resident cards before an immigrant visa becomes available. CIS will not process the immigrant visa application until a visa has become available according to the Application Final Action Date chart. In other words, prospective immigrants residing abroad can only file their immigrant visa applications under these new regulations, and the issuance of a permanent resident card will be made as soon as a visa becomes available. Applicants residing in the United States however will be able to receive an employment authorization card and advance parole travel document. These changes are also significant particularly for employment-based applicants because it opens up the opportunity for employment portability within 180 days that the application for permanent residence is pending. This chart compares ‘Final Action Dates’ to the new ‘Filing Dates’ on the October Visa Bulletin. Except for the F-1 Philippines and F-3 Mexico category, the Filing Date for the majority of family-based categories is less than a year and up to 2 years earlier than the final action date. Want more information? Watch our informational video below. Questions? Please contact us for further guidance.